Question: Aesthetically pleasing equipment worth it? You're looking at the brand new Fluval Edge aquarium kit. Recently released, the kit is innovative in a number of ways. Although lots of people have been poo-pooing the practicality of the design, I think Fluval is really onto something. It's rare that a traditional equipment manufacturer incorporates such advanced design aesthetics and brings something like this to the market. I feel like some in the aquarium equipment industry have really sat up and taken notice of ADA's success with its high end line of rimless aquarium tanks and minimalist glass equipment. Of course, the aquascape inside a tank will always be the main focus, but just like any good painting, a decent frame can do wonders.Yeah, it may not have the best lighting, but when has that stopped us? So what do you think? 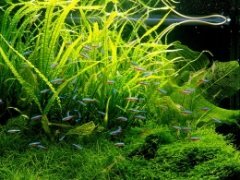 Would you spend $129 (Edit: The price has dropped a bit from this already to $119) on the Fluval Edge when an equivalent traditional tank, filter, and light would probably cost half that? How much weight do you put in your equipment's appearance? Yes, I would spend $ 119 on filter that fulfills the same function as their counterparts cheaper, but had a large gap in terms of aesthetic appeal. Hoses and plastic pipes are useful, but are far from pretty, as materials such as glass and acrylic are the most beautiful, I agree, but are far from being practical, and they are very sensitive. Form over function has never been very important to me. There are certain practical aspects of keeping a tank that the Edge, however Frank Loyd Wright in appearance, makes difficult. Planting, driftwood, rocks, catching sick fish, are all more difficult. If I were to spend a higher dollar amount for a tank I would do so for something like an ADA Rimless. The edge just reminds me of those tacky fish tank coffee tables. I suppose I'm just more interested in what's inside the tank, than the tank itself. I for one am very happy to see more companies jumping on the 'looking good' bandwagon. I long for the days that all aquariums (reefs, planted and otherwise) look just as good outside as they do on the inside. However, design for the sake of design with a disregard for practically is just a waste of time. Good design has to lend itself to functionality as well as aesthetics. Now to get people to make the surrounding area of the tank look good too. Absolutely. what I buy with this product is not the equipment - but the design thought, the aesthetics, which, if one to achieve with "cheaper" equipment - will cost 3 times as much. and by the way it is 119$ already. I guess the iPhone shows that folks are willing to pay much more for less functionality and more design. I'm with Chad on this, so I would pass on this tank. Still, I'm glad to see fluval pushing the envelope a bit. I do own the Eclipse 6 and I've been really happy with it. 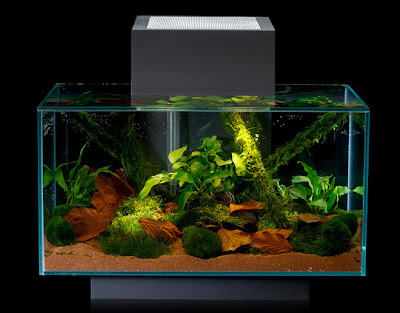 This EDGE aquarium is beautiful, but so much LESS functional on day-to-day basis that I would not own one. I would pay more for something that is both more beautiful, and more functional. I think a bow-front Euro lidless tank would be both more beautiful and more functional, than a basic square tank, if I had only the non-jumpy-outy kinds of livestock. Like the above guy, I don't fancy catching a fish with my hand stuck in the top of this thing's tiny fishbowl opening with a little net. while that IS a nice looking tank, I'm not sure I could justify twice the amount, if not more (e.g. buying used would be even cheaper). I would go for it.Its looking so cool. It's ok to sacrifice some function for form from time to time. Even the BiOrb had a new take on the aquarium bowl. It doesn't always have to be this way though -just look at the Fluval G series filters! I am looking into purchasing a larger trimless aquarium after buying the EDGE (which as a designer and someone looking for a tank that would be visible and therefore needs to be attractive from all sides - am loving). I'm having so much fun with my EDGE that I'm really excited to begin larger scale aquascaping! For anyone looking for a smaller tank I would highly recommend this set up. I'm cheap! I only put money on fish and plants. End of the story. In the past I have generally focused on the more practical aspects of fish care (and indeed amphibians too) but now I feel reasonably comfortable keeping most common fish I am really erring on the side of making my tanks look as good as is humanly possible so assuming the above setup works as well as others I would certainly consider it. Unless you install your aquarium on a wall at eye level, the traditional aquarium prevents you from seeing roughly 50% of the aquascape from a standing position, due to the lid. Honestly, what is the point of having a beautiful aquarium inside, if it isn't easy to see without crouching over or squatting? I am so glad that they came out with this tank and am seriously thinking about getting it if I can scrape together the money for it. If I subsequently need to make modifications, so be it. It's not like aqua hobbyists don't already make mods up the yinyang.